The geography of Lyonesse today varies widely from what it once was. The majority has sunk beneath the Deluge over a century ago. What remains are fractured kingdoms, living upon borrowed time. While the waters have ceased their rise, the resources taken for granted by many lands are now reduced to precious few. All who remain in Lyonesse struggle constantly to survive on meager portions of past richness. While many keep the spirit of Lyonesse alive, many trade heavily upon glory now swallowed by the sea. A loose federation of Kingdoms and varied lands exists still, but there is nothing of unity about them. All struggle simply to maintain what legacy they are able. Access to Lyonesse has reopened once more, as the shadowpath was recently repaired by a group out of Amber. The leaders of this repair expedition were Liam, Dominic and Malachi. Akaden: A new nation, that is rebuilding in hopes of recapturing Lyonesse's former glory. Albion: a land risen again from the depths, and infested by the undead. Ascolat: a dark realm in Lyonesse Above. 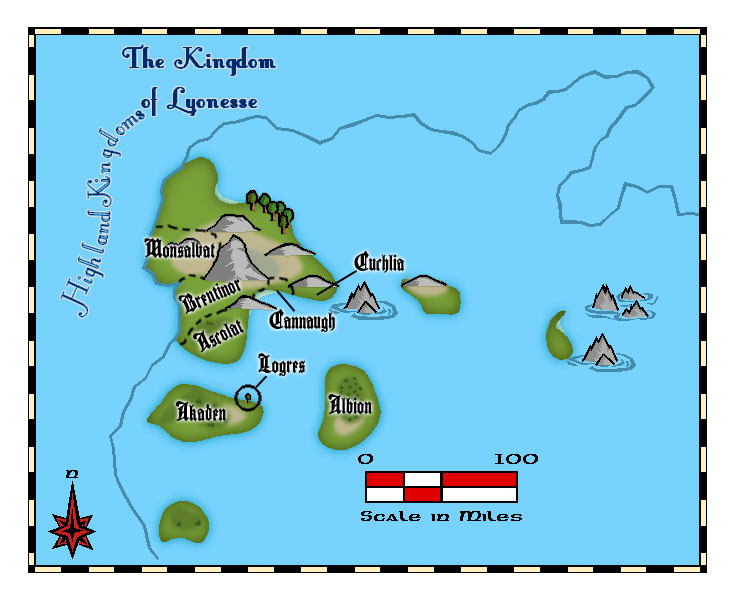 Brentinor: A small and struggling kingdom of Lyonesse: ruled by King Doriam - friend to Monsalvat, and Amber. Cannaugh: the ancestral home of Dame Nineve. Crown's Reach: It is rumoured that a stranded imperial garrison has carved out its place in the north - but few know anything other than its name. Cuchlia: home of Count Stair, and family of Sir Lucius of Karm. Logres: sunken lands, of which only a sole tree remains. Monsalvat: home of the Graal Knights, and friendly neighbour to Brentinor. Parthain: A sunken kingdom once famed for its archers; the ancestral home of Miranda's family. The Shadowpath: the path between Amber and Lyonesse. Image graciously created by Benedict of RTA, based on the main wiki. Editing by Lucius of RTA.